Quiltville's Quips & Snips!! : Galaxy-Gram! A day in Fredericksburg, TX! Irene and I headed out of San Antonio for the wild of the Texas Hill Country around 10 a.m. This morning. 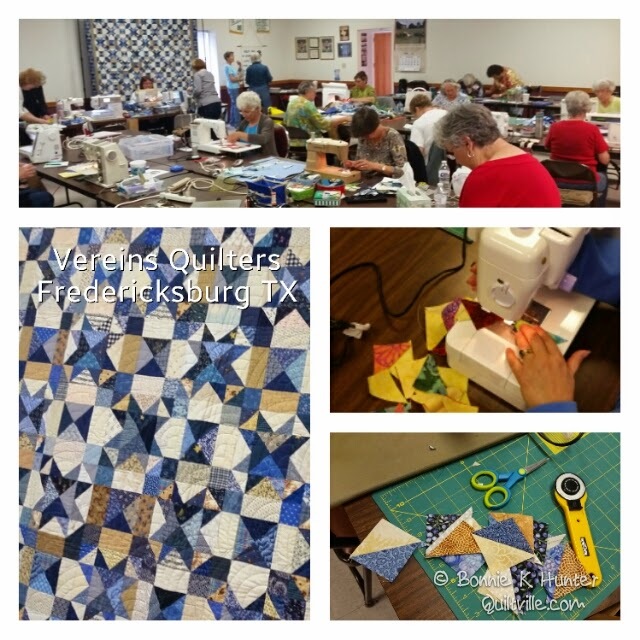 Our destination - Fredericksburg, Texas and the Vereins Quilt Guild for a My Blue Heaven workshop! Our class time went from 12:30 p.m. to 6:30 pm. So we were able to fit in a full days work shop within that span of time. I wish I had more time to spend with this group! As they presented a warm and friendly welcome, we set up machines and everything else we needed and started the day off sewing! 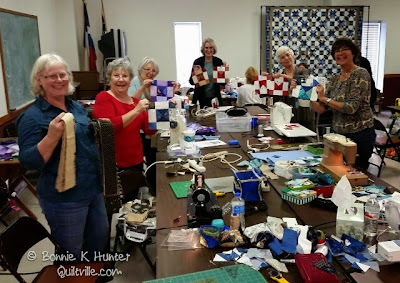 After our workshop, I was driven to Kerrville, Texas where I have just now checked into my hotel, unloaded my bags a, and AM sitting here with feet up waiting for Downton Abbey to begin. 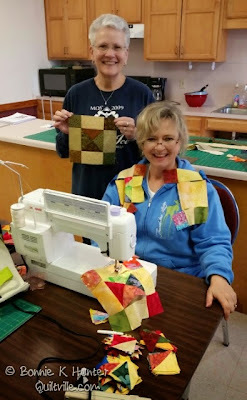 Oh, the life of a traveling itinerant quilter! 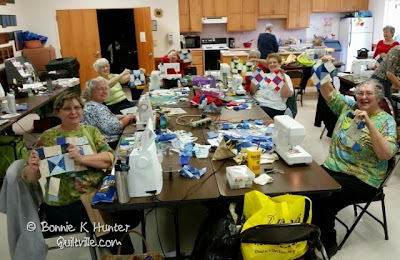 My feet may be throbbing, I'm living out of a suitcase, but I have a borrowed featherweight from Irene and more 4 patches to sew and a new group to meet with tomorrow morning for my guild meeting and presentation! 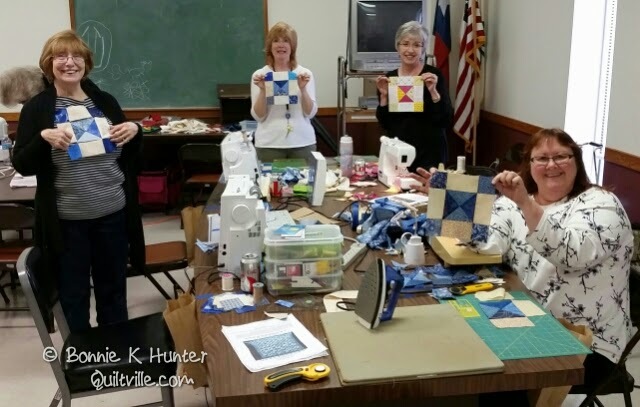 Here are just a few photos from today's workshop to whet your appetite for what I will post in tomorrow morning slideshow! Just got home from work. Waiting for Downton also. I was in Kerrville and Fredericksburg just 2 weeks ago. Wish I could have overlapped with you Bonnie. Have a great day tomorrow. Enjoy Texas. 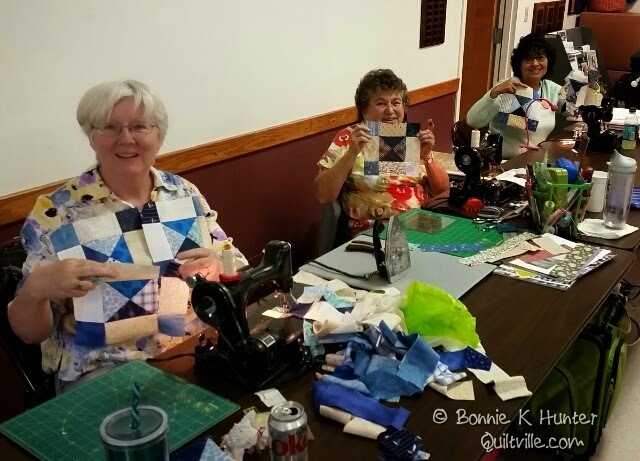 I will be moving there later this year and hope to meet some of these quilters. We had a great afternoon with Bonnie! Learned so much and got to see so many variations in colors. 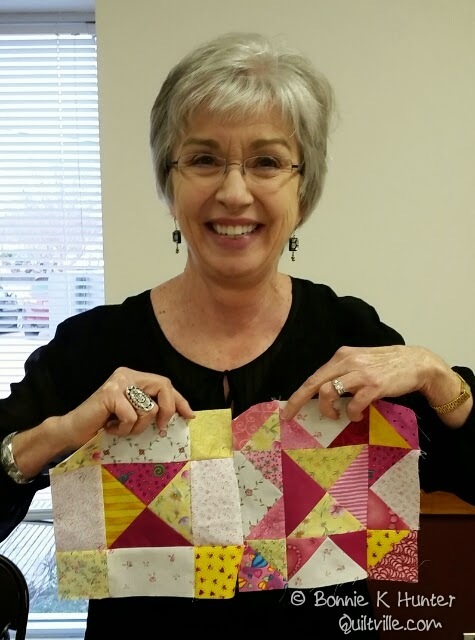 Thanks again Bonnie! Bonnie, thank you so much for the daily sharing of your quilting groups. I look forward to each and every update. One of these days I hope to sit in on one of your teaching days! The pictures you share are great! Love the quilt shop in Kerrville. DD moved from there 3 years ago and I really miss that shop. Enjoy the Hill Country. Ah Kerrville. I live there for 35 years! I'm now live 80 miles away and had I know you would have been there, I would have made the trip. Maybe I should join a quilters group so I can keep up and not miss such a wonderful opportunity to catch one of your classes. I have to refrain from the urge to daily post, "I LOVE you Bonnie"
because people would think I am nuts and I do not want to make a pest of myself or embrace Bonnie. Looks like a lot of Featherweights in this workshop. 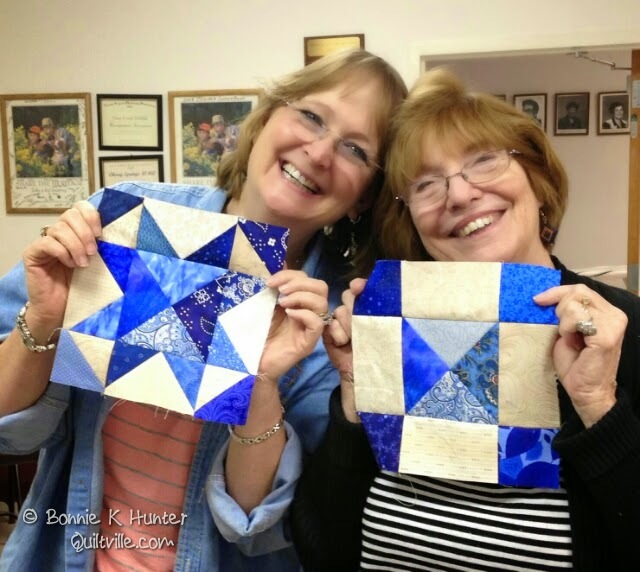 Love the My Blue Heaven and class time with Bonnie. Don't come home just yet! It's a mess in these here mountains!